Heat oven to 350°F. Spray cookie sheet with cooking spray or line with a silicone baking mat. In medium bowl, mix cream cheese, lemon juice and red pepper sauce until smooth. Stir in Cheddar cheese, onions and paprika. 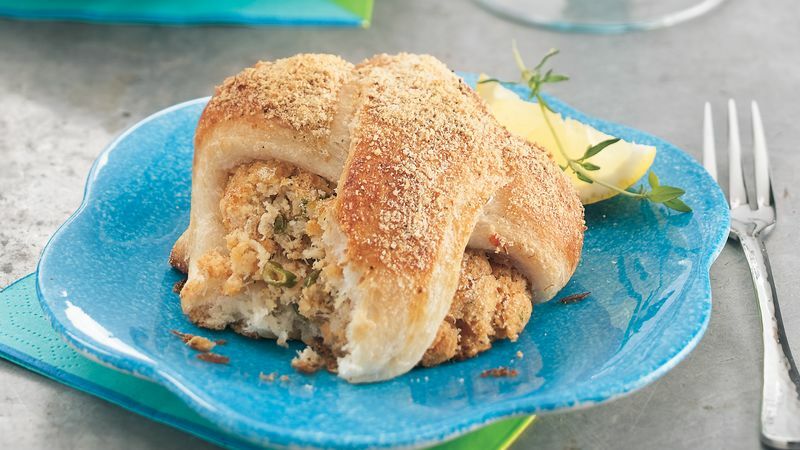 Reserve 2 tablespoons bread crumbs for topping; stir remaining bread crumbs into cream cheese mixture. Gently stir in crabmeat. Shape crabmeat mixture into 6 balls, using about 1/3 cup mixture for each; flatten slightly. Unroll dough; separate into 6 (2-breadstick) portions. Seal seam halfway up length of each portion; place 1 ball on sealed side of each. Holding dough and ball in one hand, stretch dough strips over balls, crisscrossing and tucking ends under opposite side; place on cookie sheet. Lightly brush tops and sides of dough with beaten egg; sprinkle with reserved 2 tablespoons bread crumbs. Bake 20 to 30 minutes or until golden brown. Cool 10 minutes. Serve warm.